With over 969 square feet, one king bed and separate living room, this room will be the perfect accommodation for us. Decorated in local design, our King Guest Room with a garden view offers us the perfect ambiance to relax and unwind. We’ll admire the garden views from our private balcony and large windows, watch an on-demand movie on one of two LCD televisions, take it easy in the seating area which features a chaise longue and sofa or refresh in the elegant marble bathroom with large bathtub and separate shower. Our King Guest Room – Garden View is simply wonderful! Our King Deluxe Overwater Vila is just as breathtaking as it sounds! We will relax in this 1,022 square feet villa and take in the endless lagoon views over the Pacific from our private water-side balcony or king canopy bed. Together, we will watch Bora Bora's vast array of exotic marine life float past the glass floor viewing panels or enjoy our elegant, Italian marble bathroom. With amenities like air-conditioning, Wi-Fi, and satellite television, this room is exquisite! With a spacious 1,076 square feet suite, we will marvel at stunning lagoon views from our private terrace or king canopy bed in our King Lagoon View Suite. We will luxuriate in the elegant, Italian marble bathroom or stay entertained in the separate seating area with satellite television and high-speed Internet access. Air conditioning, coffee maker and ironing board make our suite truly desirable! 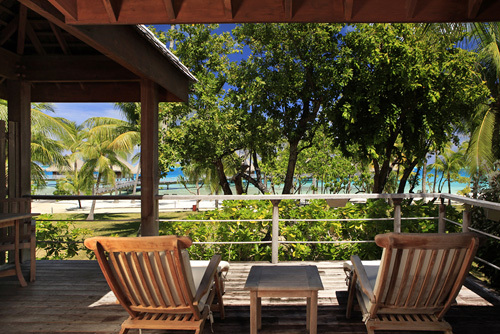 This 1,453 square feet villa offers magnificent lagoon views from our private water-side balcony. 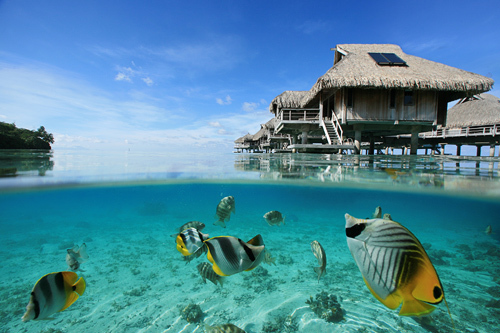 From there we will watch Bora Bora's vast array of exotic marine life float past the glass floor viewing panels. We chose this beautiful suite for its unique location, and in it we will indulge in our own private Jacuzzi on the deck. The Italian marble bathroom provides us with extra room and our separate seating area with satellite TV and high-speed Internet access allows us to watch a popular movie. 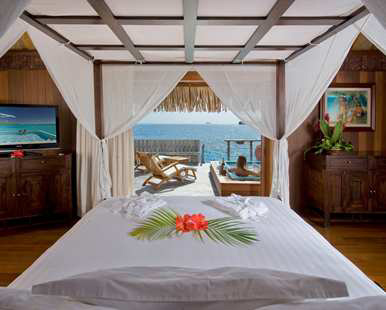 Our King Royal Overwater Villa is the perfect accommodation for our honeymoon! 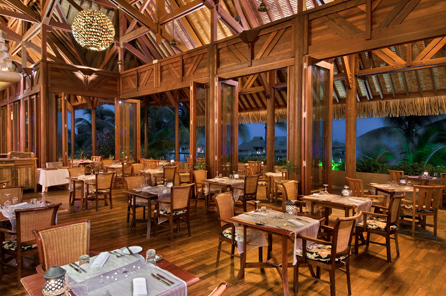 Meaning “on the surface of the water”, Iriatai Restaurant offers a fairytale setting for world–class cuisine. We will experience the exquisitely prepared mix of Polynesian, Pacific-Rim and Mediterranean specialties as we unwind in this local-style restaurant offering stunning views and exotic wood furnishings. Every Friday night, live lounge music plays and a delicious Mediterranean buffet will be served. How delicious! Nestled between the shimmering pool and the glorious white sandy beach, Tamure Grill provides an exquisite meal in this relaxed island setting. We will unwind with our feet in the sand and begin our day with a delicious breakfast in the morning sun. Every Tuesday evening, Tamure Grill hosts a buffet themed dinner with traditional dance shows. 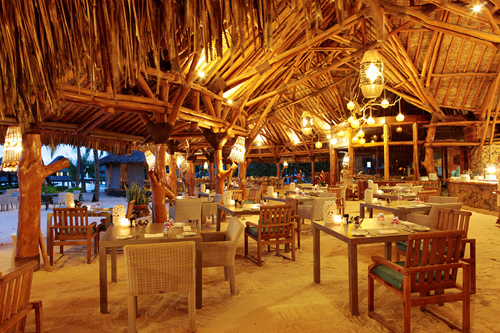 This wonderful restaurant encompasses the nature of Bora Bora! We will gaze out over the horizon and watch the sun slowly melt into the Pacific Ocean from the intimate Upa Upa Bar at the Hilton Bora Bora Nui Resort & Spa. 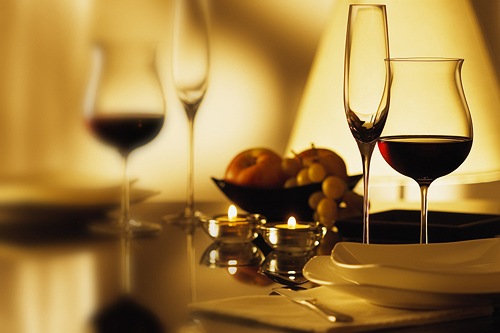 At this restaurant, we will choose from a variety of tasty traditional dishes or relax with an aperitif. Featuring traditional Polynesian décor, this elegant and welcoming lounge bar is the perfect spot to share a romantic moment as we watch the magical Bora Bora sunset. Our Romantic Experience is a unique treat for our honeymoon. We will dine at the resort's private islet, Motu Tapu, for a true island experience. This tiny islet, just a five-minute boat ride from the resort, was the private beach of the Queen Pomare IV. It can now be our destination for a unique and glamorous South Sea experience. Perfectly situated between the beach and the Hilton Bora Bora Resort & Spa's idyllic pool, Ta Ie Ie Bar offers a range of tempting snacks and exotic cocktails. 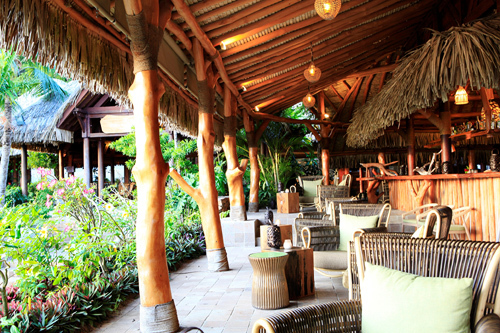 Featuring traditional French Polynesian design, this relaxed lounge bar is the perfect place to unwind in the shade and soak up the tropical surrounds. We will toast our new lives together in this colorful bar! 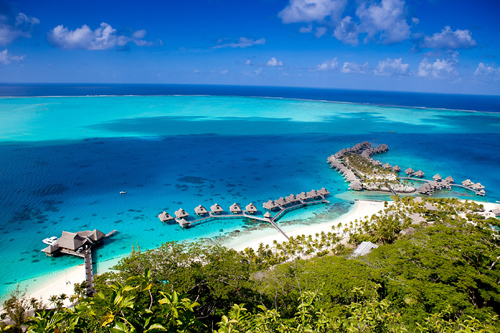 With your thoughtful gift, we will experience the trip of a lifetime to the breathtaking Hilton Bora Bora Nui Resort and Spa on the island of Bora Bora! 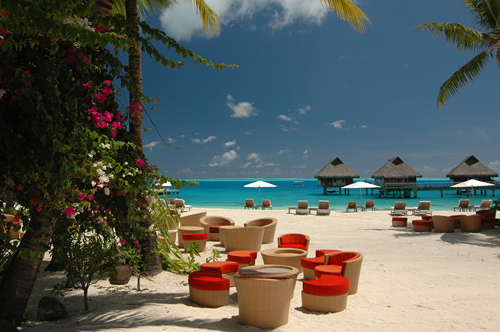 Nestled on a white beach and blue lagoon, the resort is reachable only by a private hotel boat. We will soak up the privacy of a suite or villa set over the water, on the hill or in the garden. After, we will refresh in the infinity pool, work out at the fitness center or indulge in beauty treatments at the hilltop spa. 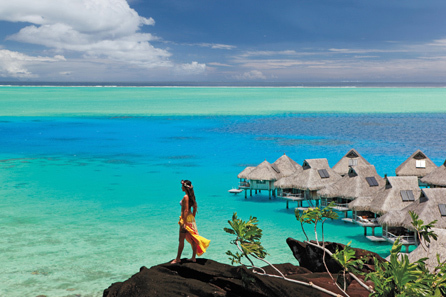 From exciting water sports to relaxing spa treatments, the Hilton Bora Bora Nui Resort and Spa promises to be everything we’ve dreamed of and more! Boasting 800 meters of sandy beach with breathtaking lagoon views, this Polynesian resort offers an idyllic setting for our honeymoon. 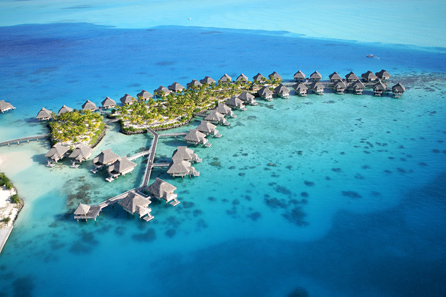 At the Hilton Bora Bora Nui Resort and Spa, we will watch the sunset with cocktails from a Polynesian-style beach bar, dine on local or Mediterranean cuisine in a relaxed island setting, and unwind by the pool or on the beach with chilled beer, exotic juices or light snacks. Activities such as “Day in Paradise” and scuba diving will take us on adventures we won’t soon forget, and the resort’s glorious spa will leave us in heaven. Your thoughtful contribution allows us to experience all of this and much more on our romantic escape! 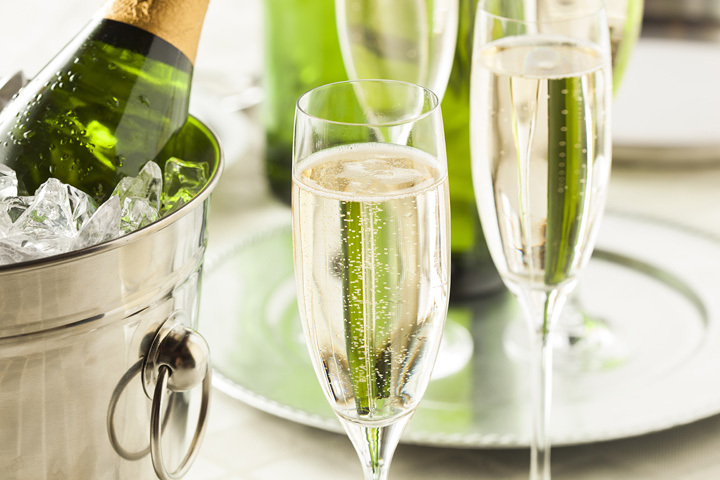 A chilled bottle of sparkling wine will be delivered to our suite. We will make a toast to our romantic honeymoon in paradise while taking in the sweeping views of the sparkling Pacific Ocean from our balcony or terrace. How romantic! A fusion of traditional and modern Polynesian massage techniques, this massage will leave me relaxed and at ease. Non-specific and intuitive, it is characterized by repetitive enveloping strokes and different levels of pressure. This special relaxing massage is designed for those who carry their stress in their neck and shoulders, those who spend long hours at the computer, or those who would like to target specific zones for preference or effect. No matter what, my muscles will be left feeling tense-free and loosened! Warm basalt stones, polished by the ocean and handpicked from Tahiti's beaches are heated and used to warm my body and melt areas of chronic tension. 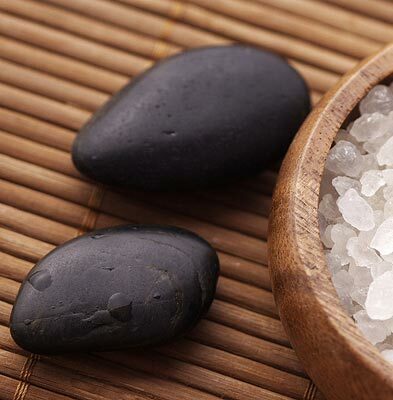 With the deeply penetrating heat and techniques employing massage with hands and the stones, this treatment is perfect for a gentle detox, a cool cloudy day, or a powerful grounding. This treatment allows my mind to travel while my body finally lets go. A more intense massage, it is intended to relieve stubborn knots and tension by working my body's muscle tissue against the bone structure. With this relaxing treat, we can take a couple’s relaxing body massage and bath of our choice in the comfort and privacy of our own bungalow. How romantic! This treatment is an exotic scrub with coco oil mix with grated coconut for a hydrating and gentle exfoliation. My skin will be left soft, smooth and hydrated, leaving me in a state of pure bliss! This healing and regenerative treatment will minimize the negative effect of over-exposure to the sun. I will begin with a gentle coconut exfoliation, and then enjoy a sun care wrap with the healing wonders of aloe, Tamanu oil and honey. This nurturing embrace will help to speed up the regenerate effect of those products on my skin. A moisturizing cream extends the benefits of this care, making any sunburn I have turn into a beautiful tan! My deluxe facial treatment utilizes the best of this classic treatment. Pore cleansing and toning, exfoliation, vapozone, deep pore extraction, massage, mask and cream are all of the techniques used to make my skin revitalized. My wrap will be the epitome of a tropical spa experience! This body mask of papaya and pineapple is enriched with a moisturizing cream to soften the skin. This classic treatment provides the best of a pedicure: cleaning, shape, polish, scrub, cuticles, massage, and nail polish. My feet will be rejoicing! Our honeymoon experience will be heightened with this wonderful couple’s massage. 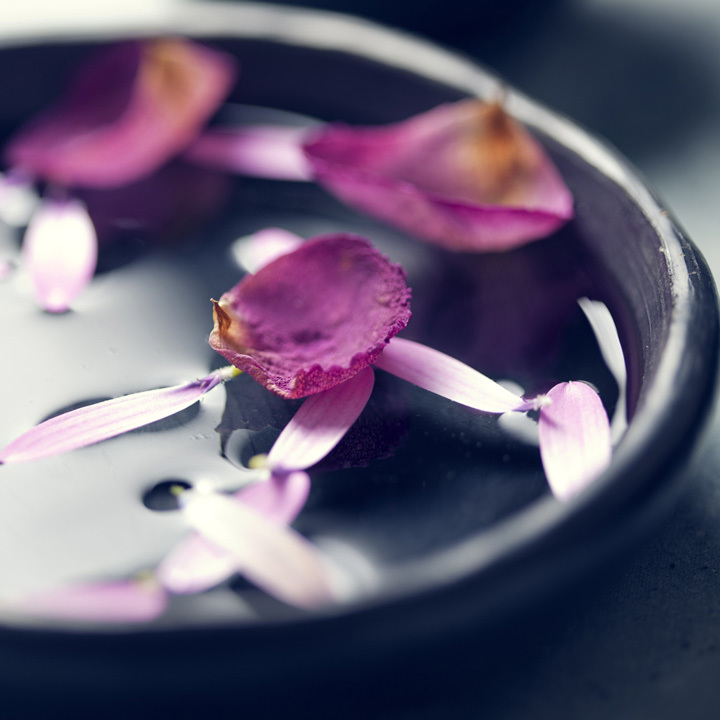 We will begin this experience with an aromatherapy bath of our choice and receive a couple’s relaxing body massage. How divine!